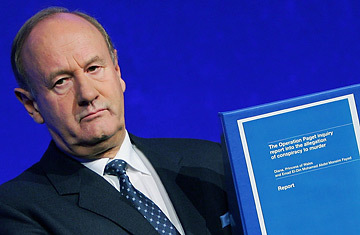 The former Commissioner of London's Metropolitan Police, Lord Stevens holds a copy of the Operation Paget inquiry report after an official British police inquiry into the Paris car crash which killed Princess Diana and Dodi Al Fayed on December 14, 2006. Jan. 27 Lord John Stevens, the former head of London's Metropolitan Police and the lead investigator into the inquiry into Diana's death, tells an interviewer, "It is a far more complex inquiry than any of us thought." Lord Stevens reveals that he meets with Mohamed Al Fayed every two months and that new technologies are allowing great progress in the inquiry. Stevens says it is "quite extraordinary how things are advancing." Chi, an Italian magazine, publishes a photo of a dying Diana, causing a huge uproar in Britain and around the world. The decision to print a black-and-white photo of Diana receiving oxygen was "vile," says Mohamed Al Fayed. The three-year British investigation into Diana's death  the first step in order to begin an official inquest  concludes with the release of an 800-page report that finds the crash was a "tragic accident," says Lord Stevens. Mohamed Al Fayed claims the report furthers a cover-up and continues to press his theory that the British establishment plotted to kill Diana to prevent her from marrying his Muslim son.